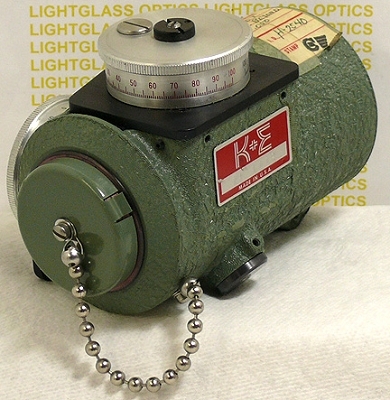 The 71-1112 Coordinate Optical Micrometer was made by the Kueffel & Esser company, now the Brunson Instrument Company manufactures a similar unit- the Model 160. Both will mount directly to the barrel of a Line Telescope with an A.I.A. Standard 2-1/4" diameter barrel. This has two optical micrometers mounted 90 degrees to one another, so you can measure variations in both the vertical and horizontal axis. Total range is +/- .100 inch, with verniers allowing measurement to .0001".